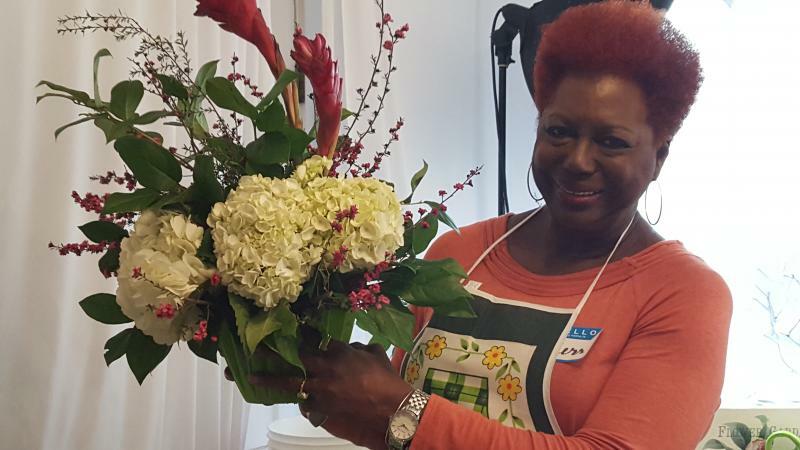 Linda will teach you the art of arranging flowers and each person will design and take home their very own floral arrangement. Seriously, It's going to be a Fun-Filled and Informative Day, Lunch while you learn, take pictures, video tape me, post me live on social media...just come on out to have some fun and learn something new with something that we ladies all love...Flowers!!!!! 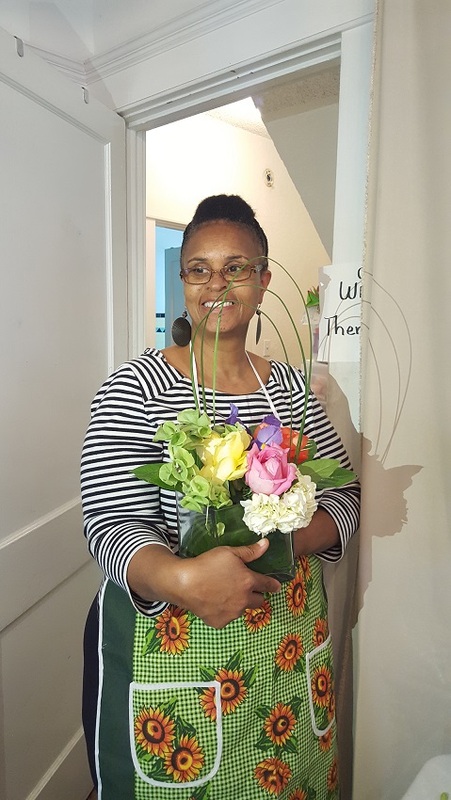 Designed her arrangement in a Square Vase lined with a Tea Leaf wrapped around the inside to hide the stems, and she used lemon leaf as her greenery. 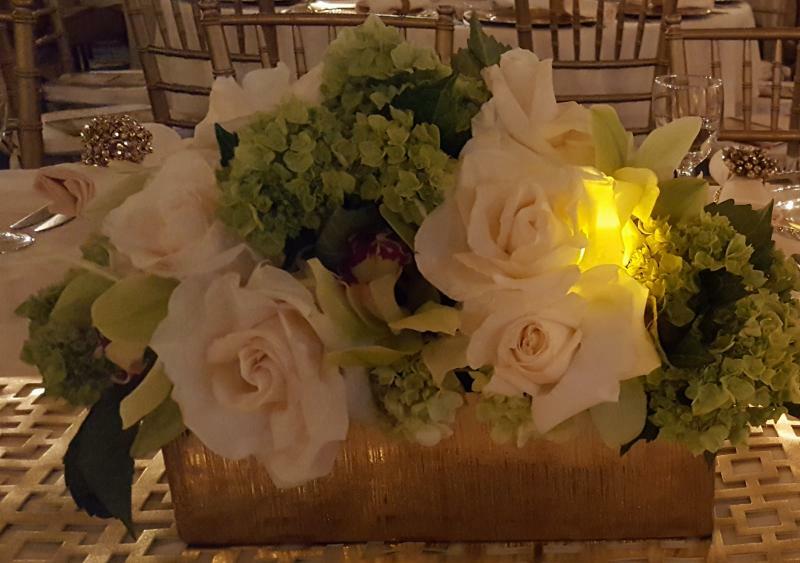 She used White Hydreangea, Pink and Yellow Roses, Purple Iris, Bells of Ireland and Bear Grass to top off her Masterpiece. 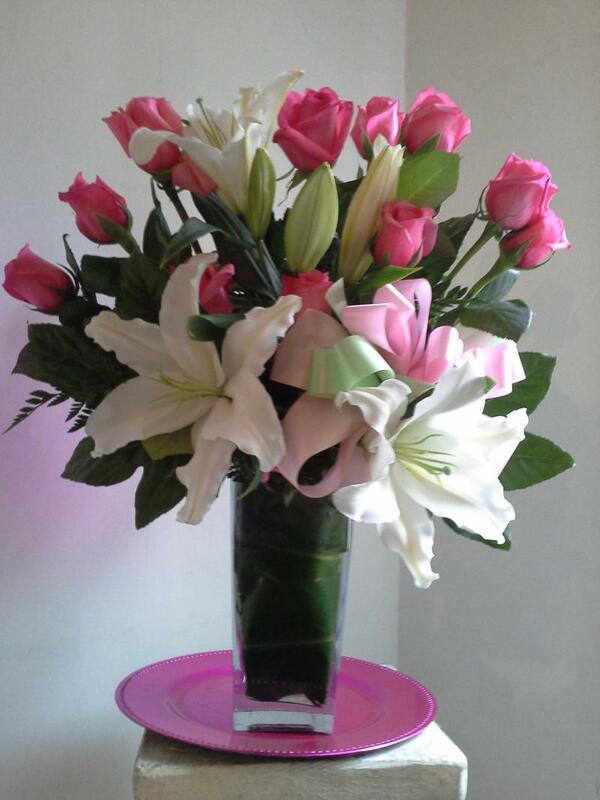 Patricia has an excellent eye and created a Darling Arrangement. 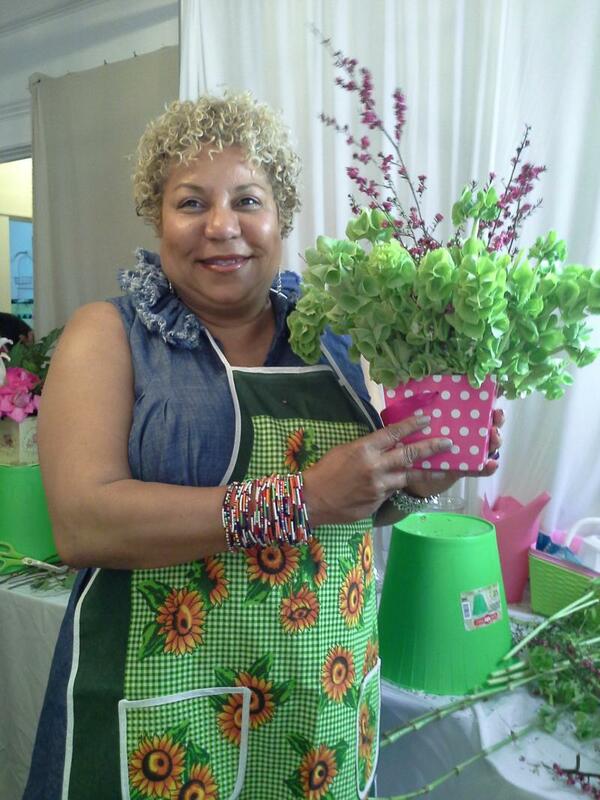 Gerri made her floral design in a Green & White Polka Dot Container. She filled it with White Hydreangeas, Lemon Leaf, Pink Ginger Stems and added a pink floral filler to round out her darling Design. Beautiful Gerri! Maxine chose to skip all the roses; the Bells of Ireland caught her eye instead. She chose a bright Pink container with white Polka Dots and embellished her arrangement with a Pink filler to enhance her design. It's very different, eye catching and her creativity in using All Bells of Ireland is genius, I just love it! 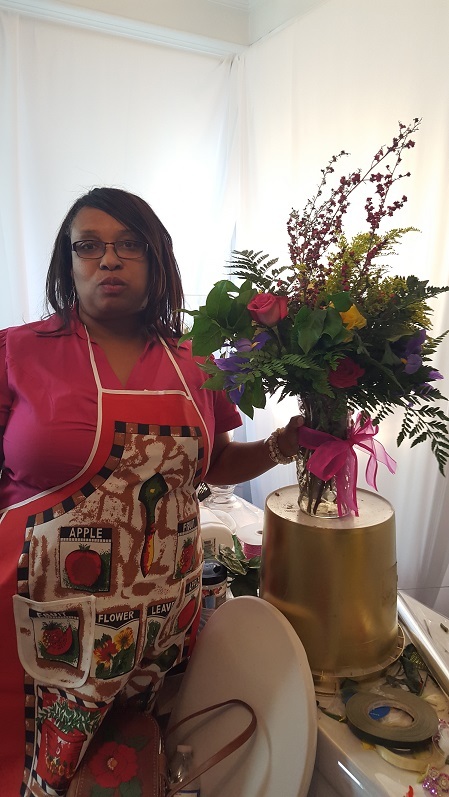 This Student opted for the Lovely Spring Arrangement using a variety of flowers in a variety of colors, like Deep Pink Roses, Purple Iris, with Yellow and Pink Fillers. She also opted to 'Green' her vase first, before adding her flowers. 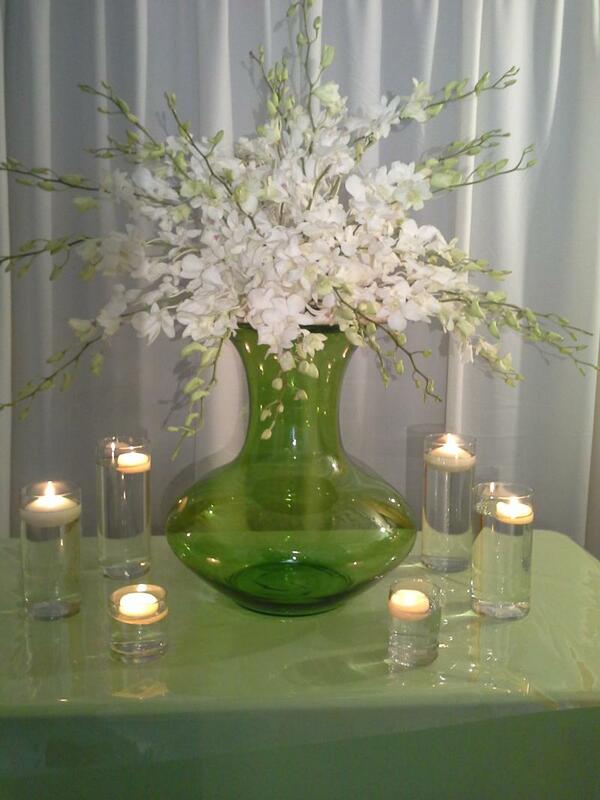 When you 'Green' Your Vase first, you're sure to stage your flowers exactly where you would like them to be. 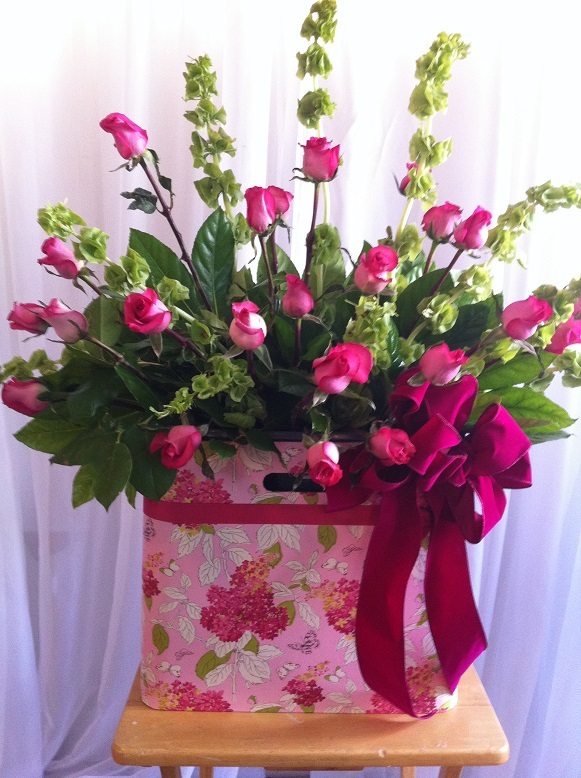 She topped it off with a beautiful hand tied bow, and it's looks like it ready for a birthday delivery....Well Done! Whatever Floral Arrangement You decide to decide to make and which ever flowers you use...You will Have So Much Fun while you're Learning...and you will see your creative side come out...students sometimes amaze themselves because they did not know that they could design florals...but we all a Little Secret Garden Inside Us. 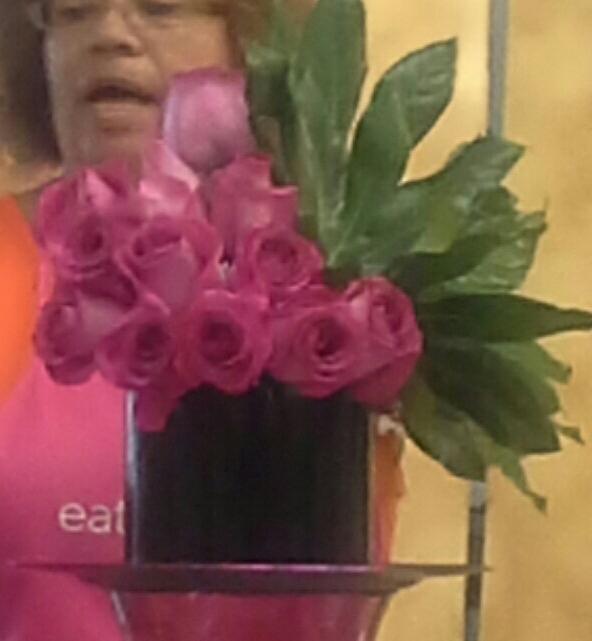 Here I opted for an Easy Centerpiece of short cut Hot Pink Roses in a Black Round Vase, with just a few leaves as my backdrop, this one is 1-2-3 and you're done. 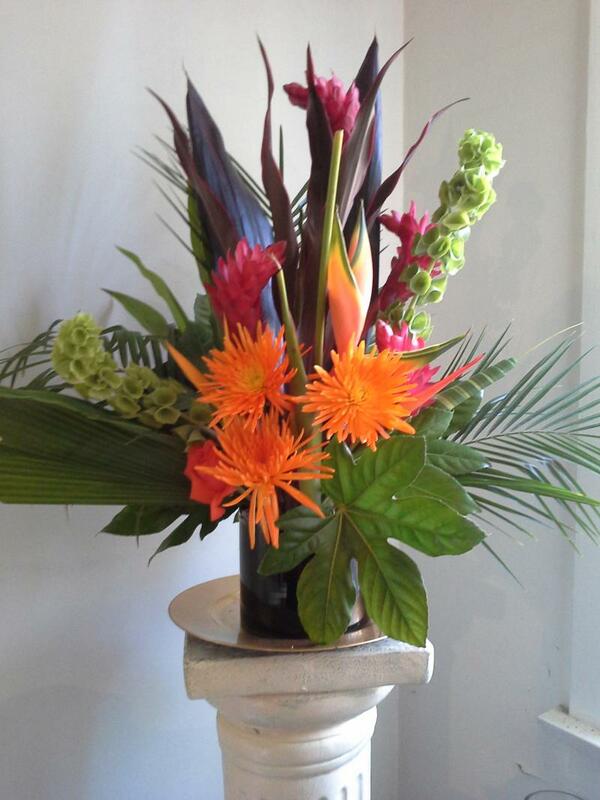 Perhaps you're feeling a little Tropical, You want something to make you feel like you're on the Islands...Birds of Paradise, Pink Ginger, Bells, Gerber Daisies, Tea Leaves, and Palm Leaves set inside a Black Vase. If you love tradition, this Rose, White Lily and Stargazer tucked inside a bed of lemon leaf is calling your name. 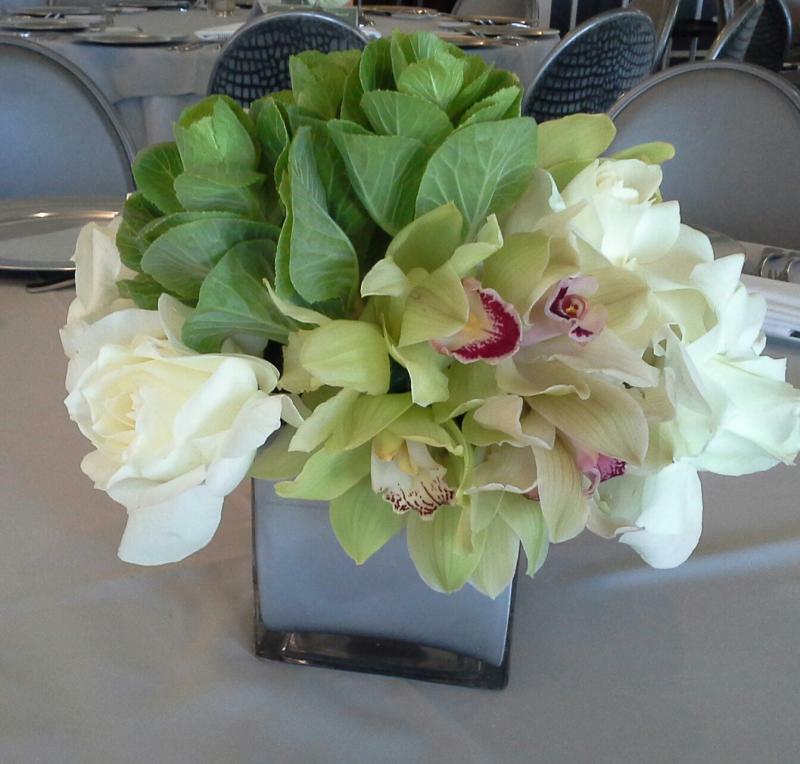 Here is a Beauty that I designed for an event at The City Club in downtown Los Angeles. The Client and the Guest just Loved it. 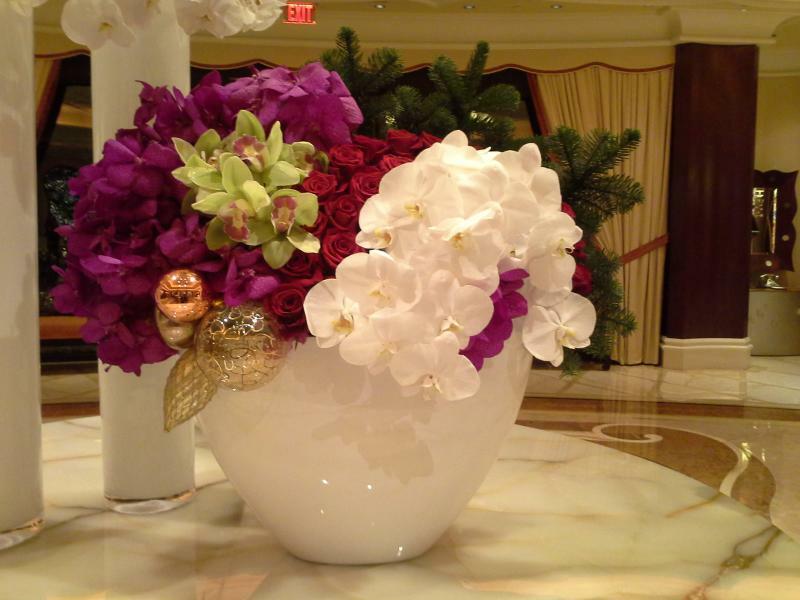 White Hand Opened Roses, Kale, and Orchids set inside a square cut vase. Simple...Yet Elegant! 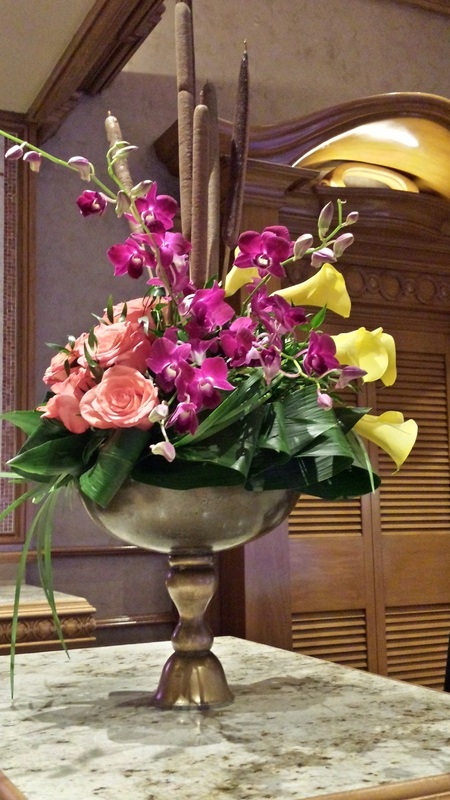 This happens to be a favorite of mine...Roses, Dendrobium Orchids, and Callas...Rich!!!! !